There are a large variety of rodents living in on all continents except Antarctica. We are only concerned with Rats and Mice because of their habit of invading our homes or business. Their success is probably due to their small size, short breeding cycle, and ability to gnaw and eat a wide variety of foods. Rodents have two incisors in the upper as well as in the lower jaw which grow continuously and must be kept worn down by gnawing; this is the origin of the name, from the Latin rodere, to gnaw, and dens, dentin, tooth. These teeth are used for cutting wood, biting through the skin of fruit, or for defense. The teeth have enamel on the outside and exposed dentin on the inside, so they self-sharpen during gnawing. Rodents lack canines, and have a space between their incisors and premolars. Nearly all rodents feed on plants, seeds in particular, but there are a few exceptions which eat insects or fish. Rodents are important in many ecosystems because they reproduce rapidly, and can function as food sources for predators, mechanisms for seed dispersal, and as disease vectors. Although mice may live up to two years in the lab, the average mouse in the wild lives only about 5 months, primarily due to heavy predation. Cats, wild dogs, foxes, birds of prey, snakes and even certain kinds of insects have been known to prey heavily upon mice. Nevertheless, due to its remarkable adaptability to almost any environment, and its ability to live communally with humans, the mouse is regarded to be the third most successful mammalian species living on Earth today, after humans and the rat. Mice can be harmful pests, damaging and eating crops and spreading diseases through their parasites and feces. In western North America, breathing dust that has come in contact with mouse feces has been linked to the deadly Hantavirus. The original motivation for the domestication of cats is thought to have been for their predation of mice and their relatives, the rats. Mice range in size from 5 to 7 in (130 to 180 mm) long (including a long tail). They weigh from .25 to 2 oz (7.1 to 57 g). The coat color ranges from white to brown to gray. Most mice have a pointed snout with long whiskers, round ears, and thin tails. Many mice scurry along the ground, but some can hop or jump. Mice are timid, social, and territorial. They are usually active in the night time, while others, such as the harvest mouse, are active both day and night. Mice rely on their senses while exploring their environment. One dominant sense is that of olfaction. While exploring their environment, mice actively sniff to acquire information about their surroundings. Sniffing behavior is therefore important in guiding behaviors such as feeding, reproduction, and rearing young. While resting a mouse will sniff between 2-4 times a second, a frequency which increases to levels between 6-15 times a second when the animal is aroused or actively exploring odors. Breeding onset is at about 50 days of age in both females and males, although females may have their first estrus at 25-40 days. Mice are polyestrous and breed year round; the average gestation period is 20 days. Rats are various medium sized, long-tailed rodents of the super family Muroidea. “True rats” are members of the genus Rattus, the most important of which to humans are the black rat, Rattus rattus, and the brown rat, Rattus norvegicus. Many members of other rodent genera and families are also called rats and share many characteristics with true rats. Rats are distinguished from mice by their size; rats generally have bodies longer than 12 cm (5 in). In Western Countries, many people keep domesticated rats as pets. These are of the species R norvegicus which originated in the grasslands of China and spread to Europe and eventually, in 1775, to the New World. Pet rats are Brown Rats descended from those bred for research, and are often called “Fancy Rats “but are the same species as the common city “sewer” rat. Domesticated rats tend to be both more docile than their wild ancestors and more disease prone, presumably due to inbreeding. The common species are opportunistic survivors and often live with and near humans. The Black Plague is traditionally believed to have been caused by the micro-organismYersinia pestis, carried by the Tropical Rat Flea (Xenopsylla cheopis) which preyed on R. rattus living in European cities of the day; these rats were victims of the plague themselves. While modern wild rats can carry Leptespirosis and some other “zoonotic” conditions (those which can be transferred across species, to humans, for example), these conditions are in fact rarely found (not true in Neotropical countries). Wild rats living in good environments are typically healthy and robust animals. 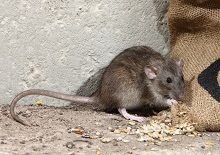 Wild rats living in cities may suffer from poor diets and internal parasites and mites, but do not generally spread disease to humans. The normal lifespan of rats ranges from two to five years, and is typically three years. The Black Rat (Rattus rattus) (alt. Asian black rat, Ship Rat, Roof Rat, House Rat, Alexandrine Rat, Old English Rat) is a common long-tailed rodent of the genus Rattus (rats) Despite its name, it exhibits several color forms.rat Compared to the Brown Rat, it is a poorer swimmer, but more agile and a better climber, tending even to flee upwards. It is usually black to light brown in color with a lighter underside. A typical rat will be 15 to 20 cm long with a further 20 cm of tail. It is nocturnal and omnivorous, with a preference for grains. In a suitable environment it will breed throughout the year, with a female producing three to six litters of up to ten young. Females may regulate their production of offspring during times when food is scarce, throwing as few as only one litter a year. R. rattus lives for about 2-3 years. Social groups of up to sixty can be formed.